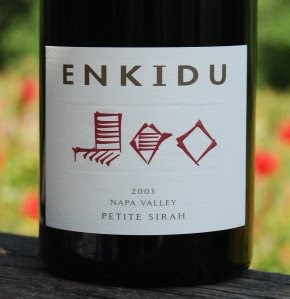 Good Wine Under $20: The Wild Man of Grapes: Enkidu Petite Sirah. Joel from Wine Life Today had a 2005 Enkidu Russian River Syrah for WBW #43, and that got me thinking--didn't I have a bottle of their wine somewhere? I remember being attracted to the winery's name (Enkidu is the Wild Man of the ancient epic Gilgamesh), the ancient script on the label, and the unusual 500 ml bottle size (some sources tell me the name for a 500 ml bottle is an imp--but I'd love to know for sure so please tell me if you know). Sure enough, a bit of rummaging revealed that I did have some Enkidu wine: a Petite Sirah, which would go just perfectly with the BBQ chicken I was planning to make for dinner. Enkidu Wine is owned by Phillip Staehle. He got his start at Carmenet Vineyards, and when he ventured out on his own he decided he wanted to specialize in grapes from the Rhone and Burgundy, and use minimalist wine-making techniques to best express the character of the grape and the place where it was grown. Phillip uses fruit from a variety of vineyards in the Russian River Valley, on the Sonoma Coast, and Napa, then transforms the fruit into distinctive wines made in limited quantities. 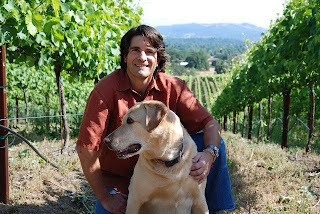 (picture of Philip and his lab--named Enkidu, of course--from Enkidu Wine). I've only had one of his wines (so far) but I loved what Phillip does with one of the brawniest, wildest grapes there is: Petite Sirah. Known for its difficult tannins, Petite Sirah is not a meek and mild grape to work with. But Phillip transforms it into something smooth and delicious--although it does have a firm, tannic edge to it. The 2003 Enkidu Petite Sirah that I tasted was the first wine that Phillip made under his own label, and 265 cases were produced. ($11.99, Chronicle Wine Cellar; you can get this from other merchants online for between $13 and $28 depending on bottle size or directly from Enkidu for $28/750ml or $19/500ml) The wine had distinct aromas of plum, rose petals, and tar. I almost never detect tar in Petite Sirah, even though it is one of the aromas/flavors associated with the grape. Phillip gives the grapes maximum hang time to develop the black fruitiness and tar the grape is known for, and this also helps to keep the tannins in check. The flavors echoed the aromas, with plum, spice, and tar and a tannic finish that is long, but slightly drying. This was one of the best Petite Sirah I've ever had, and if you can get 500ml for under $15 as I did, it certainly makes the excellent QPR mark. Even if you pay more, I think you will agree that the quality is very high for the price paid. I will have to look for this one. Also like the 500ml size--smaller bottle means we can open more! Exactly, Taster B! Perfect for 2 people. I know it's terrible for the environment, but I do wish these smaller format bottles were more popular.